2017 FIAT 124 SPIDER by Jim Corbran, Automotive Columnist Yes, the shape does look familiar, only not in a Fiat sort of way. The new 124 Spider is actually based on Mazda’s MX-5 Miata — certainly not a bad starting point! It’ll be Fiat’s first non 500-based car since the brand’s U.S. revival which began with the 2012 500 hatchback. It’s also Fiat’s first North American roadster since the demise of the original 124 Spider (below) in the 1980s, and comes right around the 50th anniversary of the car’s introduction in 1965. The new 2017 model will differ from Mazda’s version in styling, especially the front and rear ends. You may pick up the homage paid to the original 124 in the new car’s front grille as well as the hood’s “power humps.” It will be powered by a 1.4L Multi-Air® Turbo engine rated at 160 hp, mated to either a six-speed manual or automatic transmission, and will be equipped with a manually-operated soft top, easily raised or lowered from the driver’s seat. Two trim levels will be offered: Classica and Lusso. Both will be available in a choice of six exterior colors, with an additional triple-coat crystal white being a choice for the Lusso (luxury) model. Expect to see the new 124 Spider in U.S. Fiat showrooms beginning next summer. 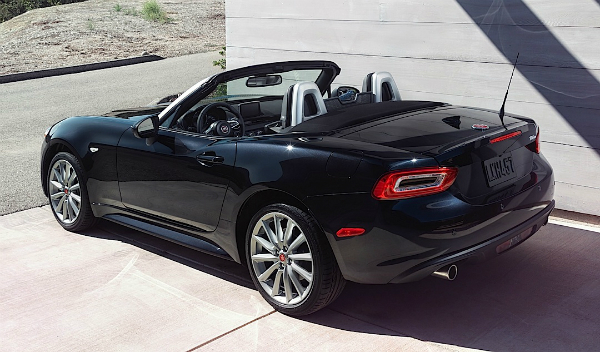 In the mean time… See more here: 2017 Fiat 124 Spider ### The post 2017 FIAT 124 SPIDER appeared first on Buffalo Cars.